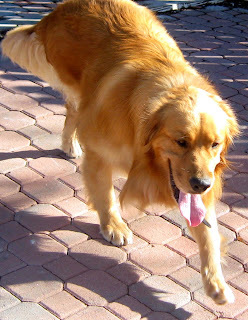 Meet "Beekers," 3-Legged Rescue is Biggest Loser (and Winner) in 2011! Okay, here's a great story to start your new year. Last week I had the pleasure of doing a feature article about Beekers, a 3-legged golden retriever stray who was picked up by a Good Samaritan in Rancho Bernardo on Dec. 9. He was taken to the Carlsbad shelter and on Dec. 21 was adopted by Debbie Schroeder, wife of Vista firefighter Jeff Schroeder. Beekers weighed 81 pounds when he arrived at the shelter, and was already down to 73 by the time he went home. His goal weight for the new year is 63.You can read Beekers' story here.